Plot – After their partners are murdered in a heist gone wrong, Chicago widows Veronica (Davis), Linda (Rodriguez) and Alice (Debicki) set about pulling off a heist of their own to pay off debts owing and to give themselves a chance of starting a new life. 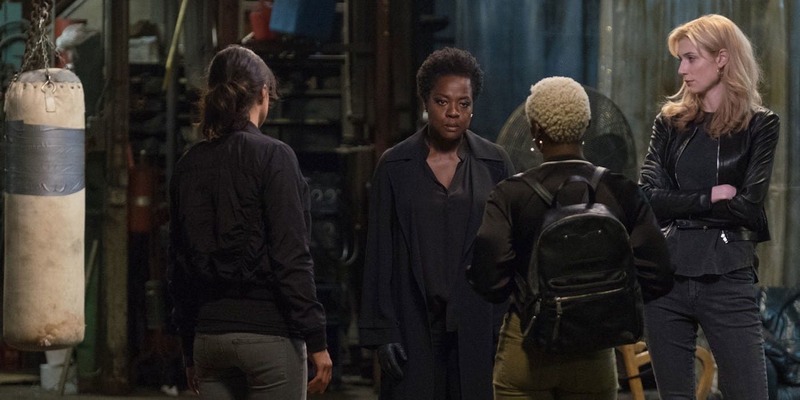 A heist film this is not, going into Widows and expecting it to be will likely leave you highly disappointed but thankfully just because Steve McQueen’s film isn’t what some may’ve expected it to be doesn’t mean it’s not one of the year’s most unique, energetic and entertaining high-profile releases. Seemingly an odd match for a director whose made his mark with purely dramatic offerings, Hunger, Shame and 12 Years a Slave, this adaptation of the old-school UK TV show of the same name, that has seen McQueen team-up with Gone Girl author Gillian Flynn appears on paper to be a strange career choice for the Oscar nominated filmmaker but using the seemingly simple set-up of a bunch of widowers taking up their deceased criminal partners mantle and pulling off a daring heist, Flynn and McQueen create an incendiary look at the city of Chicago as Widows shines a light on the underbelly of the city’s current climate. It becomes a fairly loaded plotline as we follow Viola Davis’s determined Veronica as she, with the help of Elizabeth Debicki’s Alice and Michelle Rodriguez’s Linda look to clear their husband’s debts after they botched a heist involving government officials and a large sum of money but that’s not all the films concerned with as McQueen brings in a collection of side plots and twist and turns that includes Collin Farrell and Brian Tyree Henry warring election candidates and Daniel Kayuuya’s vicious gangster Jatemme Manning going about his business of recovering money that was stolen from him and his gangster/politican brother. In many ways there’s almost too much going on in Widows two hour runtime, as the film deals with its hefty collection of characters and narrative arcs and in doing so the film in some ways becomes a little bit of a cold experience emotionally as we don’t get to know some of McQueen and Flynn’s characters like we would like to, but it’s a slight criticism of a film that’s so slickly made and filled with notable turns. As we’ve come to expect from McQueen, who graduated from artist to filmmaker in the late 2000’s (arguably thesame thing), Widows is a visually stunning and well-made film that’s backed up by a non-intrusive but atmospheric Hans Zimmer score that combines well with the filmmaker’s vision, that includes a standout opening car chase, wince-inducing scenes in a basketball stadium and bowling alley and a memorising car conversation that takes us on a tour of Chicago’s social divide between the rich and the poor. When combined with many of the solid acting turns, these scenes help give Widows a vibrancy and style that make it such a standout event. Lead by the always intense Davis, Widows is also a nice showcase for the growth of fellow actresses Debicki, Rodriquez and up and comer Cynthia Erivo who all deliver fabulous turns and even if Daniel Kayuuya (in a tight race with the scene-stealing dog from Game Night fame) steals the film with his few intense scenes, it’s fantastic to see a female-centric cast work so well together and considering just how bad Ocean’s 8 was in the female empowerment/heist sub-genre early this year, Widows is even more of a cinematic delight. A loaded and politically motivated crime drama, Widows has a lot to say in a short time and while it may not exactly strike it rich emotionally, this is another prime example of why McQueen is one of the best director’s working today, offering a thrilling and surprising new addition to his brilliant C.V. This movie confused me. I thought there was far too many scenes on the politics happening in the background, though you do reference this. He certainly did steal the scenes he was in, for suuuuure. I just didn’t really understand why that element had to be there at all, i was looking forward to a straight up heist film I guess. I also agree that we don’t get to know the characters, but for me thats more that a slight criticism. None of the women were three dimensional in any way. I feel this could’ve been a deadset classic shame it wasn’t but still had a good time with it. More I think about it the more I wish the actual heist was better to. Oh for sure I was really expecting the heist to be a lot better overall but I found it really underwhelming. The more I think about it the more I feel like this film could’ve been a lot more. It was very well made and had some great moments but overall it was forgettable and quite cold. Absolutely, and it’s a shame! I had high expectations when I went to the cinema! Oh any film by McQueen should be met with very high expectations his a fantastic director!